HISTORY OF STEELE & COWLISHAW LTD., HANLEY, STOKE ON TRENT. Steele & Cowlishaw was founded in 1924 by a partnership between Mr. George Steele and Mr. S.D. Cowlishaw, a rather ill-matched couple - Steele being reserved and difficult to approach, Cowlishaw, sociable and easy-mannered. They employed M J.B. Capey as their accountant. Previously, all three had been employed by a local engineering company that had closed down. The partners purchased Patterns and drawings of ball and pebble mills as well as flexible couplings drawings and started business in Shelton, Hanley not far from where the Cooper Street works was later established. They earned only £86 by the end of their first year but they hung on doggedly. Seven years after the business started, the staff had only increased to six but by now they were starting to exhibit their machinery in London, acquiring a reputation for high quality workmanship, design and service. Steele and Cowlishaw had not invented the ball mill but they did work hard to exploit its use, particularly by paint manufacturers. As a number of these had overseas branches, Steele and Cowlishaw exported a significant proportion of their output. 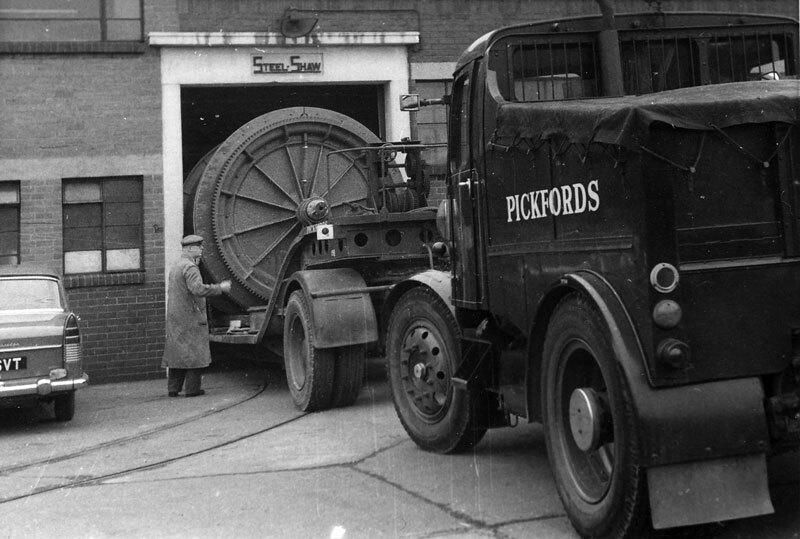 By 1939 the firm had become well established in the paint industry with a staff of 22 and 36 works employees and their turnover had reached £46,000. In 1943, Mr Cowlishaw resigned and a Limited Company was formed. Expansion continued during WW2 – pebble and ball mills were important to the war effort, being used for such diverse materials as 'dope' for treating aircraft, camouflage paints and de-lousing compounds for military uniforms. Aluminium scrap was reclaimed in a special type of ball mill based on a design originally by Krupps of Germany. The factory also fulfilled ministry sub-contracts for the supply of tank parts. By the end of the War, output had increased three-fold, buildings were being extended and a research laboratory built. The period from 1946-1949 was exceptionally busy but in 1949 Mr George Steele retired due to ill health and the business was purchased by Appleyards of Leeds. Mr Frank Limb became managing director and concentrated on improving the business still further. New types of machinery were introduced and the works buildings and plant extended yet again. By this time, many overseas agents had been established and the trade name – "Steel-Shaw" – was recognised in many parts of the world. Leaving the factory (with inches to spare), a huge ceramic lined ball mill destined for ICI Wilton to be used for plastic granule grinding. By the time that Baker Perkins acquired the company in May 1958, it was in good financial shape and the product line dovetailed admirably into that of Baker Perkins. Steele & Cowlishaw were early entrants into the plastics revolution, their equipment taking the raw plastic, mixing it with extra ingredients and colouring and producing the finished material from which plastic products are made. 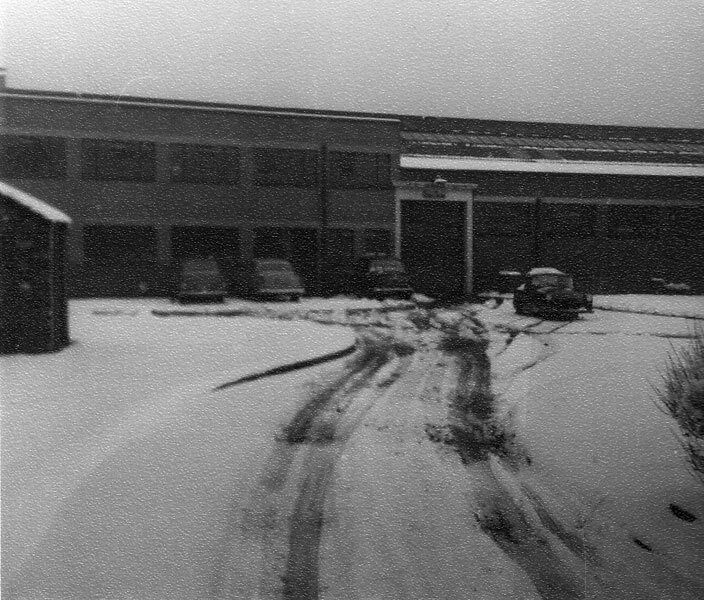 Main Factory Building circa 1962. 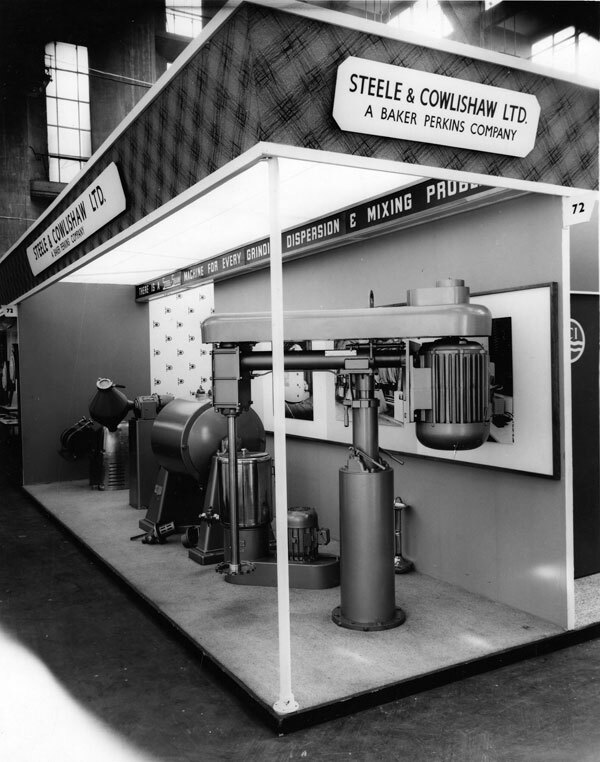 Steele & Cowlishaw was made a subsidiary of Baker Perkins Chemical Machinery Ltd in 1962 and in 1965 embarked on an expansion plan to meet the heavy demands imposed by order-taking that had increased by 50% since 1964. 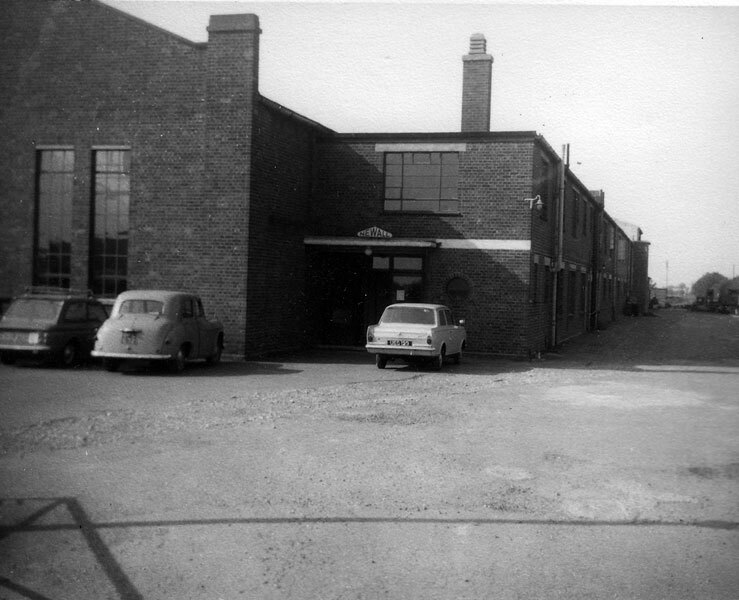 The first investment was in a £34,000 extension to the fabricating shop, doubling its size, followed, in 1966, by new £68,000 workshops with more extensions in 1967 including 14,000 square feet of factory space, a new drawing office three times as large as the previous one, together with a new heavy machine shop, tool room and compressor house. 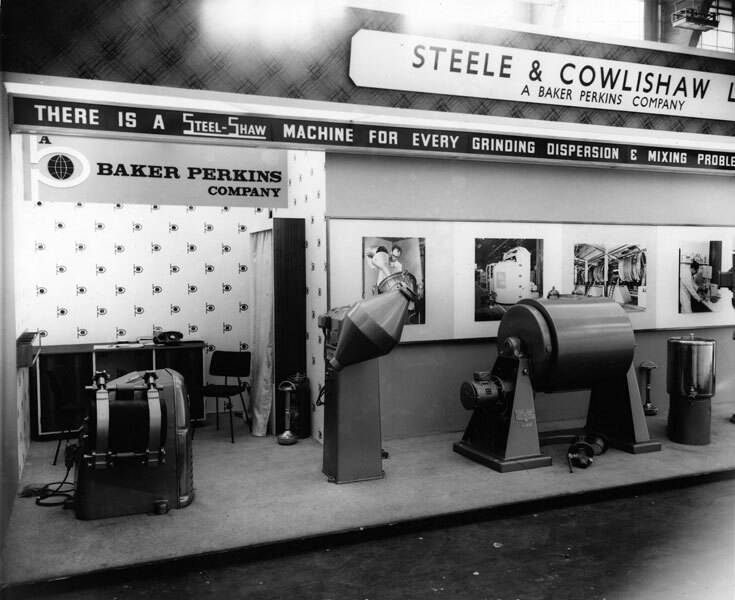 Newly branded as "A Baker Perkins Company", Steel & Cowlishaw exhibit at a localTrade Show in 1972. Advisory & Components Services, Weybridge, developers of a range of machinery for the production of glass fibre reinforced plastic sheets, was acquired in November 1973 and placed under the management control of Steele & Cowlishaw Ltd.
"On returning from my first spell of work in Brazil, after Christmas, 1958, I reported to Paul Edmonds in Peterborough, only to be told to see Frank Austin. He was the semi-retired ex-Chief Accountant, who had a fearsome reputation as a martinet and who suffered from extremely poor eyesight. I had never previously met Mr Austin and he did not exactly charm me at that first meeting. His message was that Baker Perkins had bought a small manufacturer of mixing machinery, based in Stoke-on-rent, called Steele & Cowlishaw, and that he wanted me to relieve his assistant who had been trying to get to grips with that company's accounts since purchase a month or two earlier. It did not sound much of a challenge to me but I agreed to go. Within a week of meeting Austin, early in January 1959, I was installed in a Hanley private hotel called the Flower Pot and effectively working as Chief Accountant of S&C, whose works were situated within a few hundred yards of my hotel, behind Hanley Parish Church. The company was run by John Capey, a charming old gentleman who had been book-keeper for Messrs Steele & Cowlishaw since they had formed the company, 35 years earlier. For the period immediately before acquisition by Baker Perkins it had been owned by Appleyards of Leeds, a motor car distributor that had nothing in common with S&C although Mr Limb, the Managing Director or Chairman of Appleyards had encouraged Capey to strengthen his technical staff and initiate a quite successful product development programme. Capey made me very welcome and did not interfere with my efforts to integrate the cost accounts and to bring their systems into a shape where Baker Perkins style monthly accounts could be produced easily. At Hanley I met Jim Harley, who was doing a similar job for S&C's production methods and systems as I was doing in the accounting and financial systems. He was living at the Flower Pot Hotel, too, and he and I spent many happy evenings playing snooker at the Grand Hotel in Hanley. In due course, he and I joined with other managers in a local snooker league based upon the Gas Workers' Social Club, where we provided refreshments for visiting teams, which invariably took the form of cheese and onion sandwiches! Other members of the local management were Bill Tudor, the chief designer, Len Statham, a chemise who ran the testing laboratory, Stan Ryall, the planner and estimator and Baines, who was sales manager. There were three sales representatives, one of whom, Vaughan-Bendy, a stepson of Vaughan-Williams, the composer, was a quite hopeless salesman but a most entertaining companion. At that time, the local pottery kilns were still in the process of being converted from coal to cleaner fuels and this the remaining coal fired kilns coupled with the pollution from the mines and steel works meant that the air in the five towns comprising Stoke-on-Trent was literally soot laden. My desk top within an hour or two of being cleaned each morning would be black even with the windows closed. However, the proximity of china works such as Royal Doulton and Wedgwood resulted in many of our more important visitors arriving with their wives and as a result often I had the pleasure of escorting them around a works and often lunch later at the Potters' Club where Jack Capey was a member. After a few months, I tired of The Flower Pot and moved to digs in Newcastle-under-Lyne, the adjoining rather more up-market town. My landlady was a charming, if slightly scatty person, although her husband was not so friendly – which is not surprising as his glass vacuum business was in process of going broke. This is the reason, I guess, as to why they were looking for 'lodgers'. Stoke is surrounded by some very attractive countryside which I explored when the weather was clement. In addition, at that time Stoke City Football Club was still basking in the Stanley Matthews glory and I spent quite a number of wet and cold Saturday afternoons watching them. Furthermore, as I was not a great partisan of the Club, I did not get too depressed by the fact that as a struggling team at the foot of Division I (now the Premier League) they were beaten more often than not. In late spring 1960, after sixteen months or so, Frank Austin, on one of his occasional visits, suggested that I might care to do a similar job with other companies then being acquired. I agreed and thus my attention was focussed on the machinery division of an old established builders' merchant called Rownson, Drew & Clydesdale Ltd of London. Note: Sometime after my departure, Jack Capey retired, to be followed very briefly by Len Statham and thence Bill Tudor. Bill did much to improve profitability, although not to further integration with the chemical division of Baker Perkins Ltd. Hence, after Bill's untimely death in the early 1970s there were a number of appointments from outside, including Peter Bryant. The company metamorphosed into Baker Perkins Chemical Machinery Ltd in a new factory under control of Saginaw". "I was appointed Works Manager in November 1963 by Bill Tudor and commenced duties at Stoke in January 1964. I had met Bill and Frank Austin several times at Peterborough in my position as PA to Leslie Simpson. From my first day at Stoke, Bill and I had a good relationship, also with Cyril Eardley, Chief Draughtsman. We had a full order book and the market was seeking larger Ball Mills. Bill and I drew up plans for extending the Plate Shop and relocate goods receiving and stores, making a second entry into the factory. This created a natural flow through the factory and greatly relieved congestion in the yard at the Cooper Street entrance. This had hitherto been the only access to the factory, and with part of it used as a car park, space was limited. This extension successfully completed, plans were drawn up for relocating the drawing office into a new first floor extension over the canteen and test laboratory. The accounts department was then moved into the area vacated by the drawing office. These moves were completed and operational from August 1968. 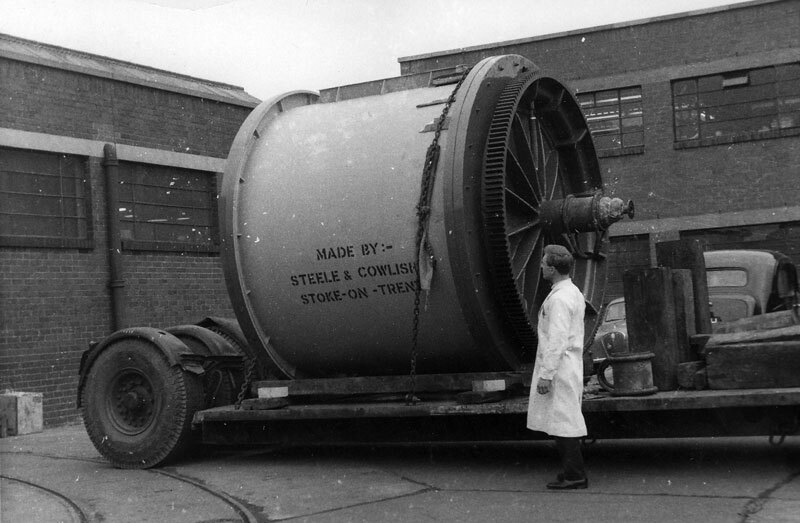 The following year saw the manufacture of two 10 ft. diameter ball mills for ICI which only had a few inches clearance either side when they were dispatched through the main gate into Cooper Street. At the end of 1969, I was appointed Chief Production Executive of Douglas Rownson in Basingstoke, effective from 1st January 1970."